Microcystin-RR (MC-RR) is a highly acute hepatotoxin produced by cyanobacteria. It is harmful to both humans and the environment. A novel aptamer was identified by the systemic evolution of ligands by exponential enrichment (SELEX) method as a recognition element for determination of MC-RR in aquatic products. The graphene oxide (GO) SELEX strategy was adopted to generate aptamers with high affinity and specificity. Of the 50 aptamer candidates tested, sequence RR-33 was found to display high affinity and selectivity, with a dissociation constant of 45.7 ± 6.8 nM. Aptamer RR-33 therefore was used as the recognition element in a fluorometric assay that proceeds as follows: (1) Biotinylated aptamer RR-33 is immobilized on the streptavidinylated wells of a microtiterplate, and carboxyfluorescein (FAM) labelled complementary DNA is then allowed to hybridize. (2) After removal of excess (unbound) cDNA, sample containing MC-RR is added and incubated at 37 °C for 2 h. (3) Displaced free cDNA is washed away and fluorescence intensity measured at excitation/emission wavelengths of 490/515 nm. The calibration plot is linear in the 0.20 to 2.5 ng·mL−1 concentration range, and the limit of detection is 80 pg·mL−1. The results indicate that the GO-SELEX technology is appropriate for the screening of aptamers against small-molecule toxins. The detection scheme was applied to the determination of MC-RR in (spiked) water, mussel and fish and gave recoveries between 91 and 98 %. The method compares favorably to a known ELISA. Conceivably, this kind of assay is applicable to other toxins for which appropriate aptamers are available. 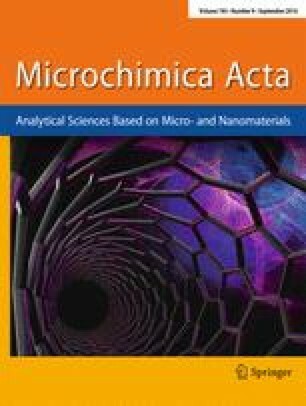 The aptamer RR-33 specific for microcystin (MC-RR) was identified by using the graphene oxide (GO) SELEX process. This aptamer was used for determination of MC-RR by a fluorometric displacement assay. The online version of this article (doi: 10.1007/s00604-016-1904-6) contains supplementary material, which is available to authorized users. This work was partially supported by the National Science and Technology Support Program of China (2015BAD17B02-5), China Postdoctoral Science Foundation (2016T90430, 2015 M580402), the NSFC (31401576, 31401575), BK20140155, Collaborative innovation center of food safety and quality control in Jiangsu Province, and S&T Support Program of Jiangsu Province BE2013732.